Our flagship store is located on the iconic Pearl Street pedestrian mall, on the corner of 15th and Pearl. Montbell chose Boulder for the first U.S. store, in 2002, because of the city's world-wide reputation as a Mecca for outdoor recreation. Nestled at the foot of the majestic Rocky Mountains at an elevation of 5,430 feet (1,655 m), Boulder boasts over 41,000 acres of protected open space and mountain parks containing more than 200 miles (322 km) of public hiking and biking trails, and numerous world-famous climbing areas. The city was recently rated the "No.1 Sports Town in America" by Outside Magazine. Why Pearl Street? 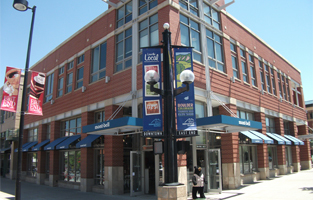 Having previously held our store in 29th Street Mall, Montbell newly opened the Pearl Street store on March 31st 2012, at the heart of Boulder. We chose Pearl Street to situate ourselves with all the outdoor lovers who come around all year round. 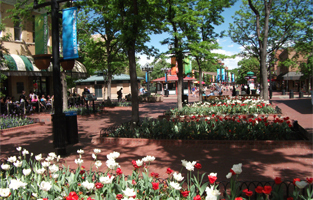 This area is extremely energetic with the best shops, cafes and restaurants all centered on Pearl Street Mall. Montbell strives to offer the best customer service and finest lightweight clothing and gear available. 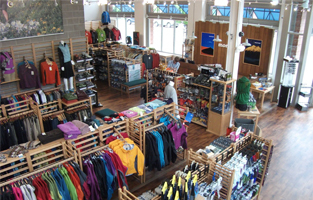 Please visit the Boulder store to check out the latest technology in ultra-light gear, or if you just need some local information. Our knowledgeable staff would be more than willing to help you prepare for any outdoor activities. One hour free parking (Monday through Friday) with any purchase at Montbell store. Drive 40 mins north on Route 36 from Denver city centers. Drive 60 mins north on Route 36 to Estes Park. Travel on the Regional Transportation District (RTD), to “Boulder Transit Center” Stations. You will arrive right in front of Pearl Street within walking distance of our store! Buses run regularly and there are even late night buses. So relax and enjoy yourself here at our flagship store!